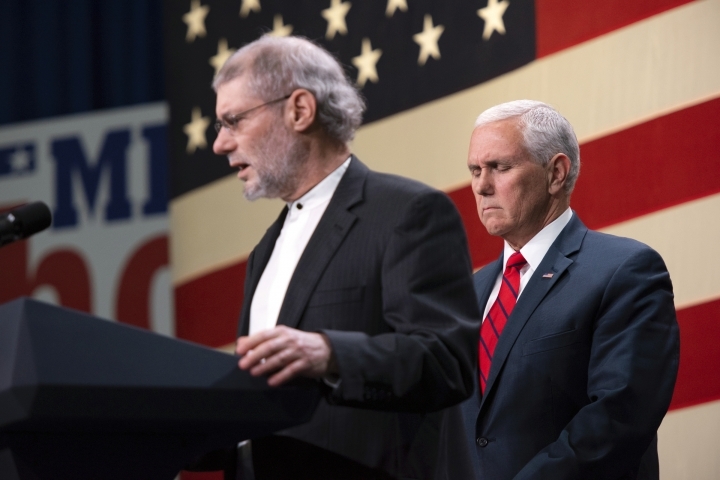 WASHINGTON — A rabbi invited to pray at a Michigan campaign stop with Vice President Mike Pence referenced "Jesus the Messiah" at the event. Rabbi Loren Jacobs of Messianic congregation Shema Yisrael offered a prayer for the victims of the Pittsburgh synagogue massacre. Messianic Jews follow Jewish law but believe that Jesus is the Messiah. A Pence aide tells The Associated Press that Jacobs was invited to pray at the event by GOP candidate Lena Epstein and says Pence didn't know who he was when he invited Jacobs back onstage to deliver a message of unity. The aide wasn't authorized to discuss the situation publicly and spoke on condition of anonymity. Epstein says she invited the rabbi's prayer "because we must unite as a nation — while embracing our religious differences — in the aftermath of Pennsylvania." She says anyone attacking her or Pence over the prayer is "guilty of nothing short of religious intolerance."